I don’t think I’ve ever seen a fish track me with its eyes when it’s out of the water, however, underwater I’ve seen them move their eyes quite frequently. Just today, I went on a dive to the Metridium Fields (at the Breakwater, enter the water several hundred feet from the jetty, right in front of the restroom, swim out a few hundred feet, then descend on the big pipe. Follow it out until the end, then head on a bearing of 0 degrees/North) with my intern and saw many incredible critters including melibes that were larger than two of my fists put together, a huge orange/white nudibranch, tons of sunflower stars, smatterings of sea nettles (which stung the intern in the face), a giant kelp greenling, perch, rockfish, gobies, octopus, crabs, barnacles, clumps of squid eggs, and a small lingcod (just short of two feet). This lingcod, unlike the one pictured above, tracked my movements with its eyes very intently as I hovered a foot away from it. I stayed just above it for a good thirty seconds, and although it clearly knew I was there and that I was interested in it, the lingcod did not budge! 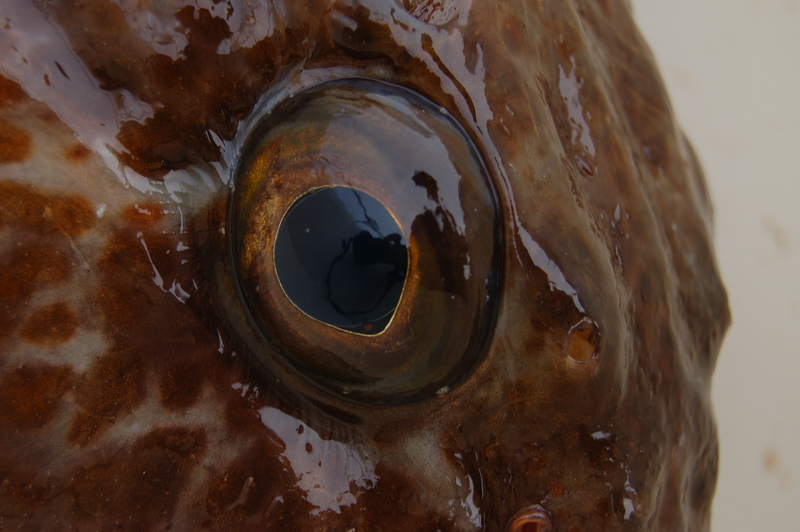 Still, I wonder why the eye of a lingcod seems to stay stationary when it is out of water, vs. the quick, minute movements that the eye makes when it’s submersed. 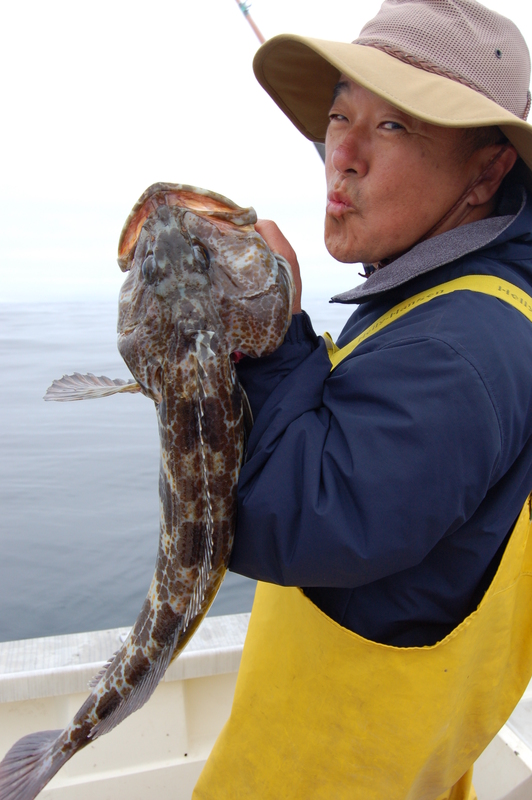 I would expect that if a lingcod was stressed out that the eye would be darting all around, above or below the water. I wonder if there’s something that prevents the fish from moving its eyes when it’s out of the water, if it does happen but I just haven’t observed it, or if there’s something else that I’m missing. In any case, lingcods have pretty cool looking eyes! In Calvin and Hobbes, there is a great thread of strips that depicts Calvin having his picture taken by his Dad, usually when he’s dressed up for the purpose of creating a family greeting card, a shot for the yearbook, etc. Though he dares not anger my Mom and sisters by making faces in family photos, he takes delight in not taking serious photos. I don’t think he planned on me posting these online though. Oh well, enjoy! 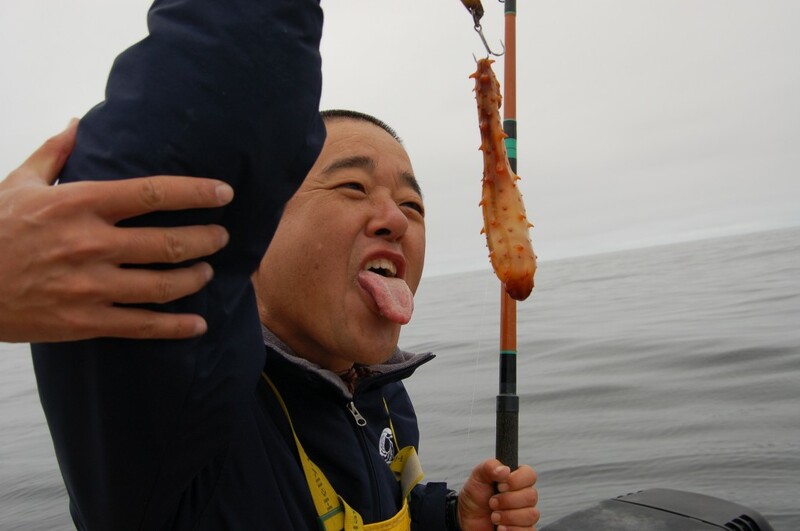 Tasting a sea cucumber (I tried to help him with this, and almost succeeded). Is it alive? 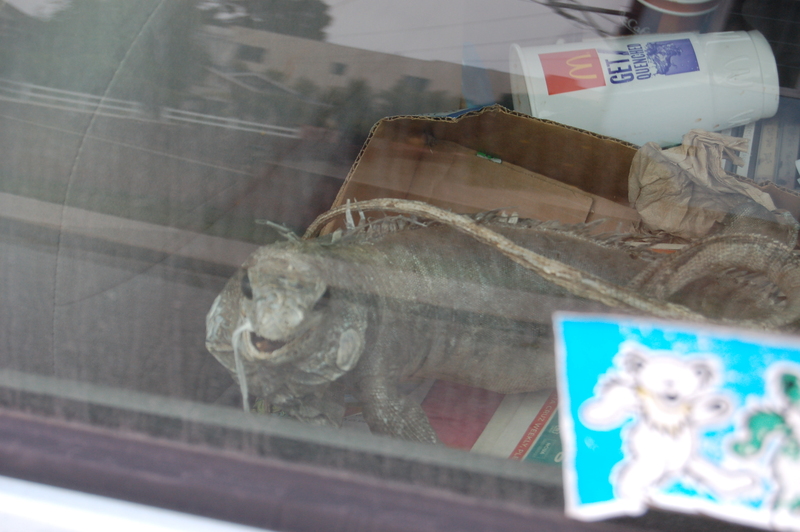 Is that large beverage for the iguana? 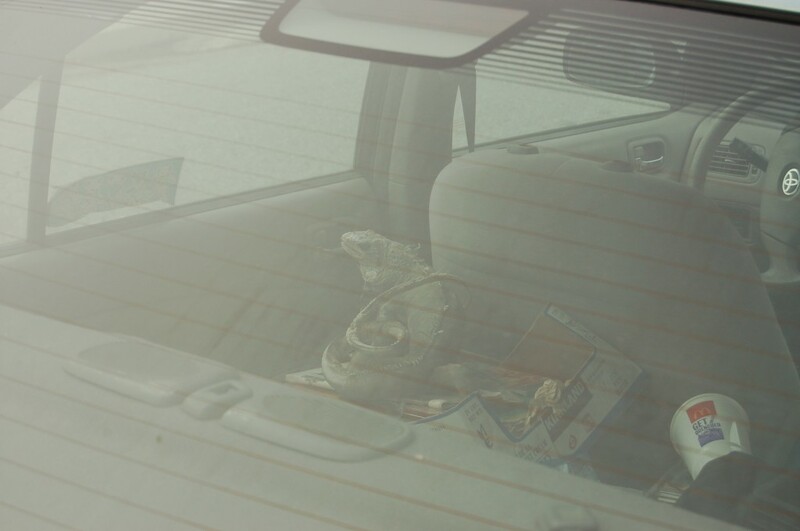 Is that lizard comfortable sitting on top of that Kirkland box, wedged behind the driver’s seat? This lizard is, very clearly, no longer alive. 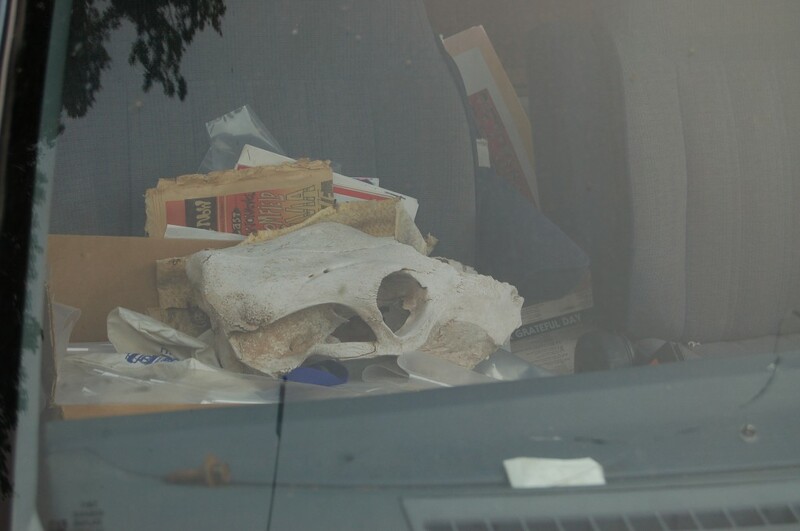 It used to sit behind the left rear passenger’s head rest, with dried out scales flaking on to the upholstery, skin delaminating from the body, and a specimen tag hanging from its open maw. Was it a beloved pet? 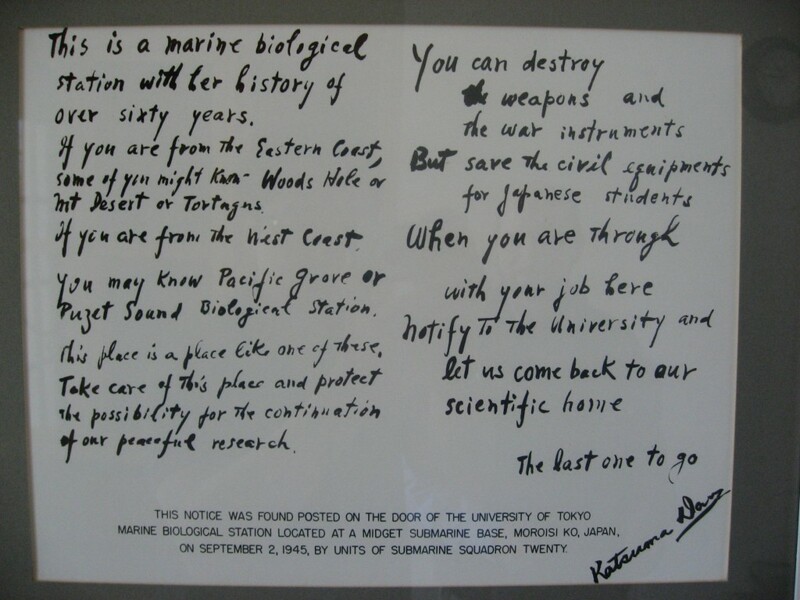 A fearsome wild animal bravely subdued, killed and cataloged by a dedicated taxonomist in the name of science? A treasured heirloom passed down from parent to child? The Grateful Dead sticker on the window only adds more questions. The stories grow richer. Sometimes if you’re in the right place and happen to be paying attention, you will find yourself trying to make sense of something, where none ever really existed in the first place. I have been itching to get into the water lately, but there have been bacteria level advisories that made jumping in the ocean seem like an idea best acted upon by someone who had a strong immune system and more free time. Then Friday came, and I suddenly didn’t care any more–I would plant my face in the bay, provided the conditions were suitable. The waves toward Asilomar are tiny, and there is scarcely a breeze to balance out the clear, sunny skies. I pull over, selecting a spot that is too exposed to the waves and surge on all but the calmest days–all but days like today. As thousands of tourists fan out on the California coastline, I don my wetsuit, strapped on a mask and fins and leave them all behind. The water is murky and brownish/bluish green in the shallows–the result of photosynthetic organisms going crazy from being fertilized by nutrient rich water and sunlight as well as the dead stuff (mostly the very same photosynthetic organisms and other detritus) pulsing and whirling around perpetually in a slow, but unrelenting food processor. As I lunge face first into the briny, cold soup, water leaks through the zipper on my back and in around my neck. Aaaaahhhh! That’s refreshing! Clearly I can see a cancer crab carapace complete with collosal claws chowing down. Is it a dungie? Rock crab? Whatever it was, it looked delicious. One moment, it was exposed, and then it was gone. Then there is another, eating the same red, fuzzy seaweed that the first had been eating. I look around, surrounded by red algae of all textures and colors, swaying hither and thither. Some are iridescent, others absorbed the light and looked luxuriously soft, like something you’d like to wrap around you on a cold and rainy morning when you don’t have to get out of bed. After a deep breath, I look down and am startled to see the rocks swaying past the kelp! “That didn’t happen”, said my brain, something it will constantly have to remind itself. When everything else is in perpetual motion–the kelp, the water, the fish, and the observer (me), the stationary world looks like it’s moving. It’s quite an unorienting sensation, not having a point of reference that you can depend on underwater. Like a psychotic pair of bifocals, when my head pops above the surface, I can focus and instantly know what’s going on, but when I submerge, it’s different enough to be confusing at times. I felt as if I were in a dream, because these were not the rules of the real world that I was used to. My heuristics were vulnerable out here. My brain was being hacked by H2O. As I approach the guano encrusted rocks, upon which perched lazy cormorants, tiny bubbles tumbled with the crash of each wave, obscuring the view. Though the waves breaking on the sandy beach were small, out here away from the shore they rise out of the water, then crash with a ferocity that you wouldn’t appreciate unless you were right underneath. I imagine it might look similar to the view you get from being inside the neck of a vigorously shaken (not stirred) champagne bottle after having the cork popped. Fun. And a bit scary. Swimming around the rocks in the bubbly, aquamarine water I try to put the thought of what I must look like to any potential white sharks, namely, a really dumb and grossly misshapen pinniped, out of my head. I note that it’s in these areas, the really creepy and well-oxygenated areas, that the larval rockfish prefer to hang out. Maybe they are safe here for the very reason that my subconscious mind is screaming at me. I find a passage through the boulders–a gully that had been carved by water and rocks–and ride the waves through an area that I would have to crawl through otherwise. This is a world of windows that are ever opening and closing around me in a strange synchronicity. A hole in the kelp exposes a sunflower star for an instant, then it vanishes in a thicket of sea grass. The grass and algae sway over and around each other, and then unexpectedly they part, revealing the star, and a keyhole limpet. There’s simply no way we can know more than a tiny fraction of what’s going on in this world. The best I can hope to do is to concentrate on one of the many events and hold on to it. I pass through a thick, healthy curtain of feathered boa kelp and scare a large school of barred surf perch! They brake into two groups, swimming laterally by me and rejoin each other past my fins. Strange that all of these animals in the sea tend to hang out in very specific areas and seemingly nowhere else. I reflect on not seeing many rockfish, and swim over to the thick tangle of kelp that forms a mat a few acres wide. I find the border to the kelp forest and locate a vertical rock face that’s shadowed by the dense canopy. Diving down, I find half a dozen abalone shells and methodically stick my face in holes, looking for these giant snails. Not one live abalone is to be found, which makes sense. If I could see them, so could an otter. Only the best hidden abs survived in this kelp forest. My head pushes through the matrix of stipe, pneumatocyst and blade that formed a ceiling above the water. It is a strange thing to get used to, having your vision completely obscured while swimming, and having your focus zoom in on the critters hanging out a few inches from your eyeballs. The water below is inky black, except for the columns illuminated by where I had created a hole in the surface. Sunbeams rain down like a shimmering spotlight. I look up and saw a sea otter scoping me out. Then I look down and find myself surrounded by rockfish! Where were they all before? Now they’re coming up to me, looking curiously at this ridiculously graceless, noisy land mammal. I am Gulliver among the Lilliputians. Have you ever gone to a foreign land and encountered children who have never seen your kind before? They literally think you’re an alien. That’s what it feels like. Some approach me directly, then veer off at the last moment. Others swim slow circles around me. The larger ones lurk as magnificent silhouettes amongst the columns of kelp in the background. I dive, and they scatter, but then immediately turn and follow me through the kelp. I find another submerged rock jutting up towards the canopy, and find a legal sized ling cod. Face to face we stare at each other until I have to go up for air. I descend once more, and hang out with it again. 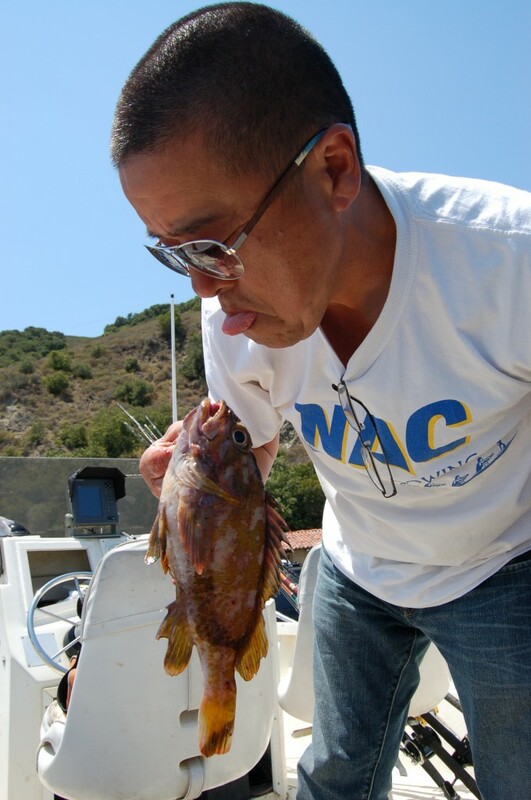 I think it is impressed by my entourage of rock fish. I come up and startle a cormorant, who decided that, unlike the rock fish, it wants nothing to do with a dumb human. I put my face in the kelp next to the rock and find a small school of tube snouts. Plunging down into a chasm lined with giant green anemones–I ride the surge through this ditch, and enter a field of sea grass. The hypnotic movement is reminiscent of the graceful curves, lines and motion that you see in shampoo/conditioner commercials, yet even more vibrant and volumnuous, seductive and sassy. The green ranges from Seven-Up green to the flourescent green of alpine lichens, to the black green of a sea turtle’s shell. Hidden amongst the strands of grass, a cabezon betrays its position by moving its jaw contrary to the flow. I dive down to say hello, and it says goodbye. Slowly, I work my way back to shore, towel off and drive home listening to some old Rolling Stones song. Given the chance, I don’t think I’d spend my afternoon doing anything else. This was perfect.